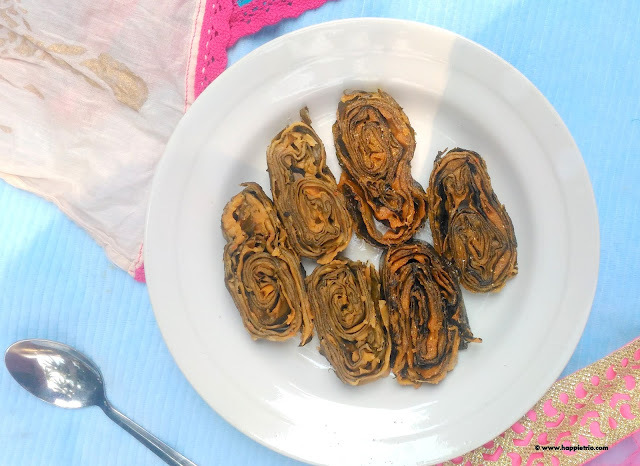 Pathrode is a popular snack from the Konkani Cuisine, few variations are made to this Pathrode and are called as Pathra in the Maharashtrian \ Gujarati cuisine. The main difference is that in Konkani cuisine Rice flour is used as the main ingredient however in Maharashtrian Cuisine gram flour is used. 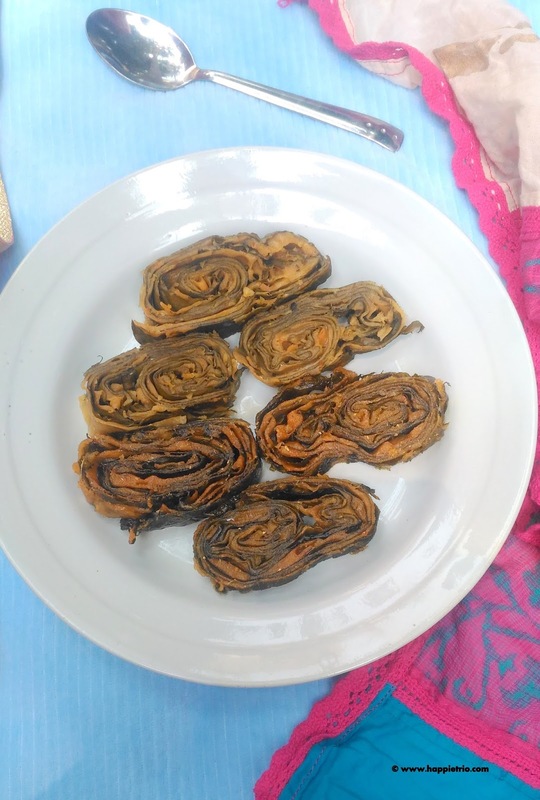 Pathrode is prepared from Colocasia leaves by applying a generous batter prepared from Rice and Coconut and few other flavoring ingredients and then steam cooked. I happened to taste this dish from my colleague and from that day onward I was totally hooked to this dish. I was hunting for Colocasia leaves since then. Few of my friends told it will be available in the Mangalore stores but then I couldn’t find it. 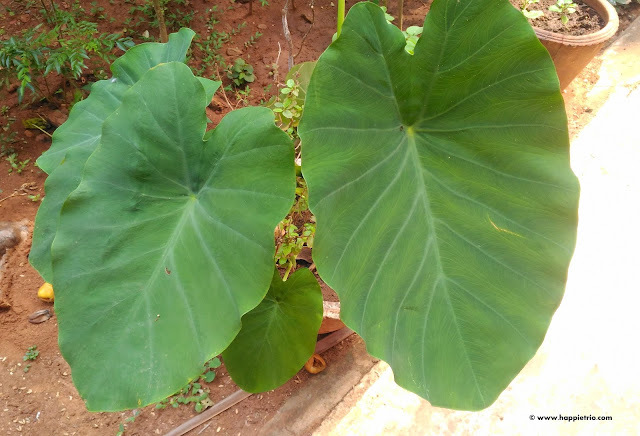 It was then I told my mom, she took an extra step and started growing Colocasia plants for me. Within 6 weeks the leaves are ready with full gloom and ready to use in cooking. This is how the Colocasia plants look like. 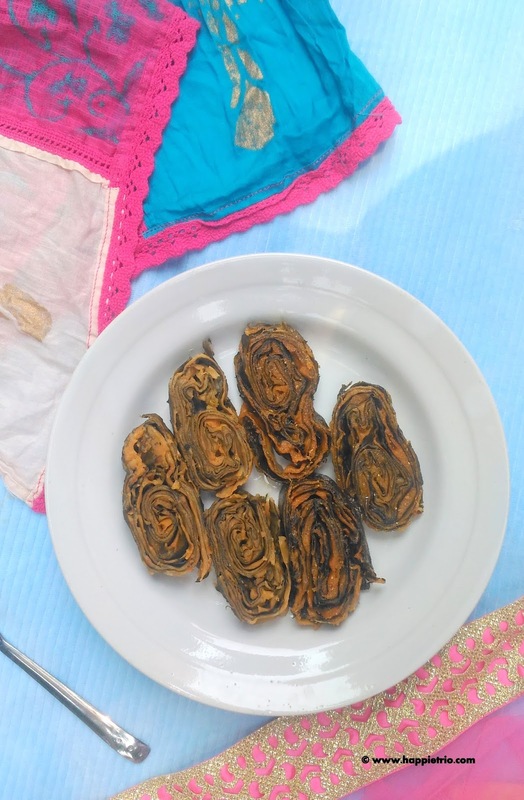 The next time when I went to my home town I immediately gave a try, If you are following me on Instagram you would have noticed that ,I shared a pic immediately after preparing J Now let’s see how to prepare Pathrode. Soak the Idli Rice for a minimum for 3-4 hours. After soaking in a blended add in Idli rice along with the other ingredients mentioned in the To Grind section. Grind along with little water, The batter should be of Idli batter consistency. If it is too runny it may not stick to the leaves. Now take the Colocassia leaves. Wash it really well and pat it to dry with a kitchen towel. Make sure the stem of the leaves are removed as it might induce a itching in the throat. Take a leaf apply the ground batter to the leaf fully as shown in the pic.After applying take another leaf and repeat the same process. Stack 4 leaves. And apply the batter for each leaf. Now fold the leaf on one side and then on the other side and start rolling the leaf. Roll the leaves fully. In a Steamer steam cook the rolled leaves for about 1 hour or 1 hour 10 mins .Don’t compromise in the cook time as, if not cooked fully it might itch the throat while eating. Allow it to cool down and then slice the cooked Pathrode. Heat a pan with oil for shallow frying. Now add the sliced pathrode and shallow fry on both sides until crisp. You can skip the shallow frying part if you don’t prefect, the sliced pathrode with shallow frying as such. However shallow frying adds a nice flavour and taste. Instead of shallow frying one more method that is usually followed is tempering the steamed pathrode with a nice tadka. Heat a pan with oil and then add mustard seeds Urad Dal, Dry Red Chilli and the Hing, Finally coconut and then add the steamed Pathrode slight mix and had. Always use a sharp knife for slicing, else the pathrode might crumble. 1. Soak the Idli Rice for a minimum for 3-4 hours. After soaking in a blended add in Idli rice along with the other ingredients mentioned in the To Grind section. 2. Grind along with little water, The batter should be of Idli batter consistency. If it is too runny it may not stick to the leaves. Now take the Colocassia leaves. Wash it really well and pat it to dry with a kitchen towel. Make sure the stem of the leaves are removed as it might induce a itching in the throat. 3. Take a leaf apply the ground batter to the leaf fully as shown in the pic.After applying take another leaf and repeat the same process. Stack 4 leaves. And apply the batter for each leaf. 4. Now fold the leaf on one side and then on the other side and start rolling the leaf. 5. or 1 hour 10 mins .Don’t compromise in the cook time as, if not cooked fully it might itch the throat while eating. 6. Allow it to cool down and then slice the cooked Pathrode. Heat a pan with oil for shallow frying. 7. Now add the sliced pathrode and shallow fry on both sides until crisp. Serve Pathrode as a snack. I have never seen colocasia plants before...this is exotic and delicious. Not sure if we have the leaves here, but something that I learned on how to get created with the leaves. Wow...Looking delicious! I have never tried this before. Looks too delicious dear!